Here in Barbados, just like many other islands it remains very hot, very windy and very dry, for weeks now. We really could use some rain to help the vegetation. Not a lot, but just enough. Similiar to the other islands Barbados this last two weeks has been inundated with heavy rains, and thunder storms. The island is soggy but yesterday for the first time the sun peeped through for longer than two hours and today Thank Goodness because of all the "goings on" leading up to our Independence Day Celebrations on Nov 30th the sun was hot and the skies were clear. It was so nice to feel the sun again. I feel sorry for all the tourists.... I believe we have had at least 216 mm of rain for the month so far and that is the airport measurement, many times here on the South coast we get tremendous downpours and the airport records nil. At least the nights are good for sleeping. with gusts up to about 80/85/90 mph in places, it has been reported. I can attest to some of those gusts (a few,not too many). It started to get real blow-y at about 8:20 a.m.
until about 10 or 11 a.m.
Min. barometric pressure (where we were) was 1004 Mb. 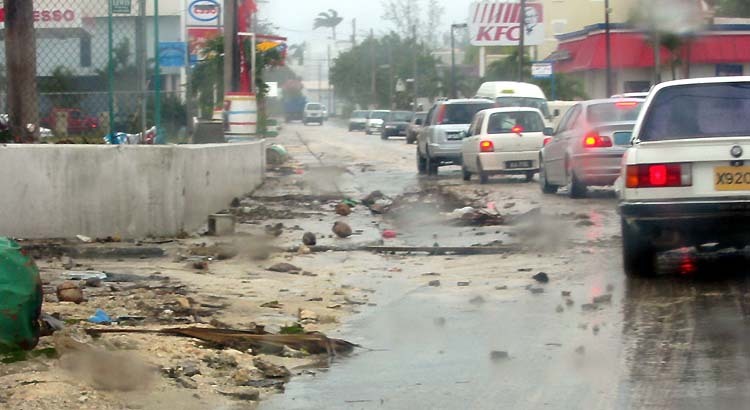 In Barbados, IVAN was 95% wind, 5% rain. as well as some aspects of the Bridgetown Port,on the SW corner of the island. is in evidence today Fri., with Mahoganies and Tamarind trees along Dayrells Rd. showing it the most. Bouganvillea growing up over my roof, at Rendezvous Ridge Ch.Ch., 1km. inland. has had its leaves toasted, above roof line level. was uprooted and turned over, falling onto the concrete dive shop,nearby(see pic attached). Barbados was very lucky it didn't suffer more collateral damage. Barbados has returned to normal. We have been so fortunate. We are gathering food, clothing, building supplies and money to help in the restoration of Grenada. Right now we need to pray for the people of Jamaica, Cayman Islands,Cuba and Florida. They still have much to bear. Christ Church, St. Philip, St. George and part of St. Michael. some small pockets still without electricity. probably restored some Barbadians faith in mankind. on too new houses were either damaged or completely lifted. Still trying desperately to make contact with Grenada. Hi all, it's 6.55 pm, the temp is 75 and the humidity is 82. Outside is very calm, and no rain. Power has returned. All in all it did not really do much to us, a few broken branches is about it. I had to go out this afternoon to assist someone on the south coast at about 2.00 pm. The roads had a some debris but not much. The sea was wild with big breakers. Came home via the east coast, nothing to report from there, all was relatively normal. Having said that there have been many reports on the radio of roofs off etc. Now our best wishes are with those in Grenada. Once again thanks for all those emails from around the world. Just got back from Bridgetown..went to inspect my mother's office..Lots of branches and downed wires on the roads. Also drove past the careenage and the surf is indeed up and crashing over the barriers by Fort Willoughby (Coast Guard Headquarters)...was indeed a sight to behold. Then took a drive along Trevor's Way on my way to inspect my friends shop in the port - wow! I am so sorry I didn't have a video camera with me...the surf reminded me of the Soup Bowl in Bathsheba...The shops in the port have suffered extensive damage, with some merchandise being washed out to sea...will obviously be a while before they can open again. On another note, I have to commend the folks at the Barbados Light and Power for the excellent job they have done to ensure that power was restored to most of the island before nightfall. Of course, there are still pockets here and there, but I suspect they too will have power within the next day or so. Again, we have been spared the wrath of a significant hurricane. But, one can only imagine what would have happened had we really had a direct hit from this system. Just heard that the system has caused extensive damage across the Grenadines, with 3 deaths reported so far. There has been 1 death reported in Barbados and investigations are continuing, but a 75 year old lady was found in a ditch of water in St. James. I think some prayers of thanks are in order and again, I wish to express my gratitude to all those who were thinking and/or praying for us. "Live everyday to the fullest"
Well after having suffered the whistle of the close shave from Ivan, and heard about the damage, if there is anything I can add to your efforts I would be happy to assist. Just for a quick report from my area of Barbados - Kent Ridge, on the South Coast inland about 5 miles. We got a lot of gusty winds, however, much to my surprise very little rain fall. It is now raining more than it did at the height of the storm. Sustained wind was making the power lines whistle but only for an hour or so. Small branches and some dead wood was broken from trees, some palm fronds were ripped down. Lots of reports of roofs ripped off houses, and renewed calls for some type of building code have once again been made, being championed by Vic Fernands of Starcomm Network. The cover of the building housing the Concord plane has been damaged. This cover was designed and constructed by an international firm - I do not currently know who - and I believe is being fixed by Williams Construction - a local firm. There has been higher than usual tides, with waves carrying some sand and rocks across the South Coast road. This seems to be worse in areas where there is little beach between the road and the sea, for example by the Kentucky Fried Chicken in Hastings. During the storm I was without power - the BL&P (power company) turned off the local supply as a precaution between 6am and 4pm when I got it back. During this time we were glued to the radio listening for news. We heard plenty of the stories of damage, but on weather reports at 8am, 11am and 2 pm there was a strange silence. I used my laptop to contact Sunbeach Internet services to get the weather reports from the NOAA site and called up VOB 790 to provide these. I do hope that next time we will hear the authorities giving us regular weather updates. It is some comfort to know that the storm is actually passing! All in all, Barbados has once again been very lucky to have the hardest winds of Ivan pass well to the South. I just hope that this, another close call, does not cause Bajans to be complacent for the next time. Powered by Plaxo Want a signature like this? I live in Rockley Christchurch and we too received power back around 3.00 after it went out at 6.00 this morning. The winds still have some bursts to them and spasmodic rain. This area seems to have fared well, I can see no damage other than leaves and branches everywhere. Reports filtering in, no loss of life but of course lots and lots of structural damage. The Globe Drive In cinema has half its screen ripped off and there is no snackbar roof. We have two or three private boats have broken their moorings at Carlisle Bay this morning and another boat has beached itself at the Boart Yard. Hastings main road under water from the sea and some Long Beach had 25 ft wave surges this morning. Amazing, apart from the winds, and rain we had no thunder and lightening, so my dogs were not really too upset as they were warm and dry in the house. We have been so lucky, again. So many reports still coming in and probably will for some time to come. Ivan "the terrible" seems to have lived up to his name. At 2:30PM power has returned to my area in Christ Church..a check with other friends and family members indicate that they are still without power and some are without telephone services. As I write, the wind continues to gust significantly. CERO has asked that people not venture out - the all-clear still has not been given. Report just in on the radio indicates that the careenage in Bridgetown is over its banks and sea-water is in the car park by Bajan Helicopters..locals have been advised to stay clear of that area as it is considered very dangerous. Seems as though parts of Christ Church in the South and St. Philip in the East have been hit hard...numerous homes without roofs in St. Philip and many uprooted trees and impassable roads in Christ Church. The structure built to house the Concorde on the airport compound has collapsed or blown away. Even though there is considerable damage, it could have been much, much worse had we had a direct hit. Bajans should consider themselves very, very lucky as the prayers everyone sent up seem to have worked. Thank you everyone. The South coast of Barbados is currently, at 5:16am, just feeling the first real gusts as Ivan, the Category 4 Hurricane which has seen supermarket shelves bared and bottled gas supplies exhausted, visits this world class destination. The Prayer Warriors have been working overtime therefore despite predictions, that the weather would deteriorate around midnight, there has been little rain so far, although the shelters have been filling since last evening and the local Authorities are taking this storm seriously. Residents have battened down and streets are deserted. Just past midnight, a beach walk showed more whitecaps than storm surge, however, as dawn breaks, wind activity is picking up and the sky is cloudy and grey and very ovdercast. Hevay showrs and possible thunderstorms are expected during the day and Our Prime Minister, the Right Honourable Owen Arthur has asked the population to stay calm and remain focussed on the fortitude that has been our Mainstay for generations. Prior to the storm, plywood sheets were used to reinforce windows and emergency services are on alert. Many residents of this 166 sq. mile island have sought refuge in shelters and non-perishable ground provisions, canned items and dried foods have been stockpiled. Ivan the Terrible has been a definite economic boost for Barbados' commercial sector. According to the first local news report of the day reported on LOVE FM, STARCOM Network news, the hurricane warning has been discontinued and a Tropical Storm warning is now in effect. As of 5 am. Ivan is currently located at Lat11.4N and 140 miles SSE of Barbados, moving west at 18mph.A Gradual turn to the west expected today. There is some likelihood that Ivan may return to Hurricane Status but it is currently a tropical Storm. St Vincent, Grenada and the Grenadines are currently under Hurricane Watch. Seas are also very rough and have had reports from those on the coast that they have never seen the surf in its present condition. We are smack dead in the middle of the storm now. It is 6:47 am. The wind is really high around here in dover gardens. The rain is comming down in torrents and almost horizontal. We are now under a tropical storm warning. We are outside the radius of the hurricane force winds. Ivan is however still a hurricane and could strengthen. The lights are starting to flicker a bit so I dont know how long before the power goes out, if at all. Barbados should expect to experience these conditons for at least the next 6 hours or so. At 6:15AM the rain is falling in torrents and the winds are extremely high. However, we are now under Tropical Storm Warning as the center is predicted to pass 100 miles to the south and Hurricane Force winds only extend out 70 miles while Tropical Force winds extend 140 miles....Hardly slept all night...was following the internet and our local TV station. Folks, the worse has not passed as yet, so please continue to keep us in your prayers. Will try to report again later if I can as I understand the power may go...some areas have already lost theirs. It is 5:45p.m. The sky is beginning to lighten. The sky looks very angry with lots of storm clouds. We are just getting some rain. The wind blew all night long. There were 2 bouts with rain but very little fell. What a relief to wake up (we did sleep a bit) and find out Ivan passed us by. We are now under a storm warning. The seas are angry with large waves beating the shore. Hope our beaches are not eroded. We have water, lights and of course the phone. I want to thank all those out there who prayed for us. Your prayers guided Ivan away. But we must continue to pray for all the others in his path. . It is now midnight and the winds seems to have picked up considerably. Just decided to venture outside for a minute before all the "action" starts. The latest prediction puts the eye of the hurricane to our south. However, folks still need to be mindful that it is the outer bands we have to worry about. To those who have been sending personal emails wishing us on the island all the best and praying for us, I send my gratitude...Keep sending up those prayers, peoples!! Will try to send another post if the connection lasts as it has been somewhat sporadic. situation closely waiting for the next bulletin. We are praying for good news!. I live in the US but our company has a call centre on Barbados. I am at the office now located in the harbour district. Pretty quiet here now at 7 pm with a few rain squalls moving through. Winds still pretty normal. There will be a few of us spending the night in this large masonry BIDC building. Although the stores were very busy today, I did not see a lot of boarding up taking place. I am very concerned about the many smaller wooden homes … I hope the occupants all choose to move to a shelter. The hype of preparing as best you can is over and now all one can do is wait.... this I believe is the hardest part. Wondering when and how bad it is going to be... to everyone here on the island of Barbados I wish for you all to be safe and tomorrow when the storm passes we can pull together and help the ones who have been hit the worst. Ok, its 9.45 pm the temp is 79 and the humidity is 79, both steady. The breeze is a bit stronger but no rain. I have recieved emails from around the world wishing us the best, thanks to you all. Will be back again soon. Well we are as ready as can be, the windows no longer have a view. The generator is full ( as is the fridge, with banks beer ). Had a little rain a few minutes ago and we are getting a few gusts of wind. We got work over with early and filled up with gas. Now its wait and see. I will report later. Showers are now starting to come ashore [just the outer bands I believe]. About 6:58 pm we had moderate downpour with a wind gust of about 20 mph. Much more to come....not much wind at the moment 7:16 pm. Well all our preparations are in order for the visit of Ivan. We spent all morning outdoors clipping branches, putting away flower pots, furniture, and anything that could become a flying missile. This will be our first hurricane. We are not quite sure as to what to expect. Looking outside from my window as I write this, I see sunshine, trees moving in the gentle breeze. Hard to believe that Ivan is out there heading for us. Some of the catagory 1 shelters on the island are now open. All police have been called back to work. Buses are stopping at 6 and the airport closes at 8. Most businesses have let staff leave for home at noon. Regular updates are on the radio. Most people are taking Ivan very seriously. The hard part is waiting . We all want it to be over. Folks, preparations should now be rushed to completion. This is not a storm to be taken lightly...As of 3:00PM the winds are picking up...quite a difference from this time last week. Just went in search of ice which will be a necessity should we loose power, and the lines at the gas stations were extremely long..In fact, some stations have run out gas...perhaps a sign of things to come??? All Category 1 shelters will open at 5 PM....our emergency offices are set and ready to go should the situation warrant it. For those of you in the cyber world who are reading this post, please send 1 up to the almighty for us...we will need it. It is now 2:00 pm. Gas stations and stores were chaotic from early this morning. It is quite hot on the outside and somewhat breezy. Last preparations are being made. We are expected to start feeling the effects of Ivan sometime after midnight. and the worst after daybreak. It is now 1pm - the radio is full of early closings, and info on hurricane necessities for each household. The roads are jammed with people going every which way, the stores are crazy with long long line ups and the gas stations have long lines too. The wind has changed direction and is now coming from the Northwest - quite breezy with scudding clouds but the sun is shining and boy is it hot....We have been advised that we shall feel the first effects this evening and the full force by tomorrow.Buses are stopping at 6pm and the airport is closing at that time too. Will advise later..
Looks like this could be the one. The warnings came a little late to say the least, today is going to be crazy at the shops ! At the moment the weather is good, 6.00 am, temperature 81 f and humidity 80 % with some clouds. I am going for the plywood first thing, everything else was done yesterday. Will send again later. Well well well,..... on the 7.00 pm news tonight we are told that the dangerous storm Ivan is heading our way and Bajans should be on alert. Now it is 7.00 pm and the stores are all closed. Imagine the panic tomorrow! God bless to everyone in this island. The director of the Central Emergency Response Organisation has advised all Barbadians to take the necessary precautions as Ivan approaches. This is not a storm to be taken lightly...We have all seen what happened in the Florida Panhandle and that was a Category 1...so as a Category 3 Barbadians need to be extremely cautious. Barbados is under Hurricane Watch....this could be the big one we have been dodging since Janet in '55...This is the time to start putting your disaster plans into motion. I daresay I don't like the looks of this one...too far south for us to really dodge the bullet this time around. Keep listening to the advisories...Might be Ivan "the terrible". stated that a tropical storm was approaching Barbados, should be here around Mon night or early Tues am. with tropical force winds and lots of rain.... ... No official warnings yet - just like St. Lucia maybe the government doesn't want to make announcements to upset the public too soon! No time is too soon right now - Ivan is almost on our doorstep and it doesn't look very friendly. Bajans have been far too complacent regarding all the storms that will of course go North - so they think - I am ready as I can be - so are all my neighbours - finishing touches tomorrow when we know exactly the status. Anyone in viewing area of this message - this is Sun afternoon - start preparing now - this could be the one that has our name on it and will not be turning North....Barbados get with the program ...now. AS OF 1 P.M., IVAN HAS EXPLODED INTO A CATEGORY 3 HURRICANE. now this has me very nervous..........!!!!!!!!!!!!!!!!!!!!!!!!!!!!!!!!!!!!!!!! The heat though today was really unbearable. Still and very humid even as I sit here typing this @ 6:21 p.m.....phewww!! Frances hurry up and guh long bout yuh business and let de trades come back nuh. Its now nice and windy on the outside with the odd shower or 2. The sun is even peeping out at times. Its now 10:06 A.M. in Barbados, and and as of 8 A.M. the Tropical Storm Warning has been downgraded to a Watch. We have been spared once again. De good lord mussey really love we lil rock. I can speak only for myself when I say although very grateful for our longstanding "luck" for the lack of a better word, I shall never become complacent. We must always pay close attention to the weather from June to November. Unpredictable it will always be. It is 7:15 Sunday morning. The wind which howled all night has increased in intensity. The rain began to fall in heavy wind driven gusts about 6:30. From my window which faces south I can see the whiteness of the surf at the coast. There is still heavy rain to the north. The rain has lessened and winds are not as strong. From where I am I can"t see any damage . Most people removed objects that could become air born last night. We were in a restaurant last night and they were putting away the hanging baskets etc. People seem to be taking the approach of Earl seriously. As of 5 p.m. The Government Of Barbados has issued a storm warning for this island. Right now on the outside, it is cloudy with light showers and light winds and very humid. 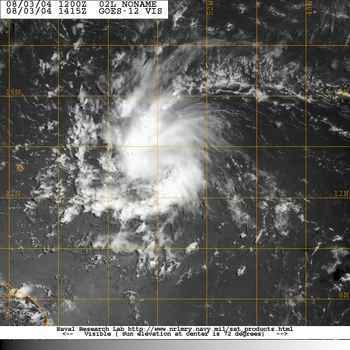 As of the 5 pm update 95L became Tropical Depression Number 5. Looks like the models support intensification to near 55 mph winds with gusts to 65 mph when it reaches Barbados, well south at approximately 12.0 N.
We have to keep an eye on this one. Right now its really hot and humid on the outside, even though the sun is about to go down. The vigour tropical wave just east of Barbados is beginning to affect the island. sporadic showers in the early hours of the morning at at this hour, around 8:45 am, overcast grey skies, with pleads of thunder, "nice" lightning and a consistent downpour. The wave is not actually here but this is the leading edge with lots of convection which I thought might have affected us yesterday. But this morning nice weather to be indoors. Things look much worse on satellite than on the ground in Barbados. I live on the easter side of the island and I've had three brief showers - heard one rumble of thunder in the distance. My wife is on a church excursion to the north of the island and they have had one brief downpour. She called recently to say that the black clouds were moving in again but they were not aborting their excursion (today is a holiday as was yesterday). 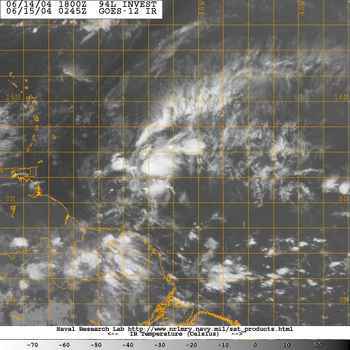 Saint Lucia has issued a Tropical Storm Warning. Tomorrow I will be in contact with them to see what is happening. Our organisation usual post official updates from each member Government at our website http://www.cdera.org/ under the "Situation Reports" news file for those who are interested. LAST PORTION OF THE FORECAST. Been having a fairly wet May..............and today was no exception. 2004 predictions suggest an above average season activity.